Hey Shelli! I only deep condition once a month (after I henna). Even then, I only leave on my deep conditioner for about 1 hour. Like you, I do pre-poo every week when I wash my hair, then follow it up with a regular rinse-out conditioner. To pre-poo, I usually use coconut oil mixed with whatever other oil I have on hand….right now it’s castor oil. I’ve read articles in the past how overnight conditioning isn’t good for the hair. In the past, when I’ve done it sometimes after I wash the conditioner out my hair would feel “mushy”. It felt weird. It’s been a while since I’ve done it. I wear mostly wash n gos and when I wear my hair straight I just deep condition with a good conditioner such as Crece Pelo or ORS Replenishing Pak from a few minutes to an hour then I rinse it out. I used to deep condition overnight after a henna treatment and my scalp would always be itchy for a couple of days afterward…I thought it was from the amla powder I added to the henna. However, after my last henna session, I deep conditioned for an hour, rinsed out and put my hair in twists…and to my surprise, I didn’t get the itchy scalp! All the time I thought the amla powder was causing the itching, no so, it was from sleeping with the dc all night…moisture in a warm environment led to an itchy scalp. No more overnight dc sessions for me…I do overnight prepoo on dry hair…no problems there. This also happened to me in the past after sleeping with my DC and then going to class for the first half of the morning. By the time I got home and washed it out, my scalp felt crazy itchy. I would spend the day after twisting my hair just scratching my head. It was a mes but all of this makes sense now. I like deep conditioning/prepooing overnight… on DRY hair only. An overnight prepoo, especially when using thick conditioners such as Aubrey Organics, is an overnight deep conditioning session. Just because we call it a prepoo (or just because we dc again after washing/co-washing) doesn’t mean that our prepoo was not also a dc (so, I’m not sure it’s 100% accurate to say that you are not dcing overnight). However, I say, keep doing what works for you, Shelli! Your regimen is obviously bestowing you with super healthy, rockin’ hair, so I say, keep it up. I like the Natural Haven website and think that it is very informative about the science of hair; but, I’ve found that the science on the website does not always jive with MY hair. For instance, my hair never ever feels as moisturized after 30 minutes of dcing as it does after an hour or two. It just doesn’t. If I rinse out after 30 minutes, I almost feel like I have wasted the dc. The same product makes my hair feel much better left in for at least 1 hour. This is something that I have noticed over my healthy hair journey, and regardless of the science behind it, at the end of the day, I have to listen to my hair. I think that you are on the right track, however, in using protein- or coconut oil-based overnight prepoos/dcs. That is probably what is keeping you from the mushy feeling and breakage that you and others might have experienced in the past. And of course, as you mentioned, if you are going to prepoo/dc overnight, it should be on DRY hair. Having your hair soaking wet with product for 8-10 hours will inevitably lead to breakage, as you suggested. As always, thanks for sharing your experiences, Shelli! I deep condition for 30 minutes….and I’m so glad to hear that this is all I need. For some reason, I can no longer sleep with conditioner or henna in my hair….my scalp starts to itch!!! I have literally gotten up in the middle of the night to rinse out my hair. I actually hate deep conditioning and force myself to do it atleast once a month. Why do you use henna in your hair for coloring? Leave my deep conditioner overnight because I start late to do my hair. By the time I put the deep conditioner on and wait the 30 min 10 min in am starting to relax so I fall asleep. When you pre poo overnight with the oil and condish what do you put on over your hair when it’s time for bed? I use an old satin bonnet. I always wondered the same thing. Will definitely try now that I know. I use a plastic baggie and a satin bonnet. 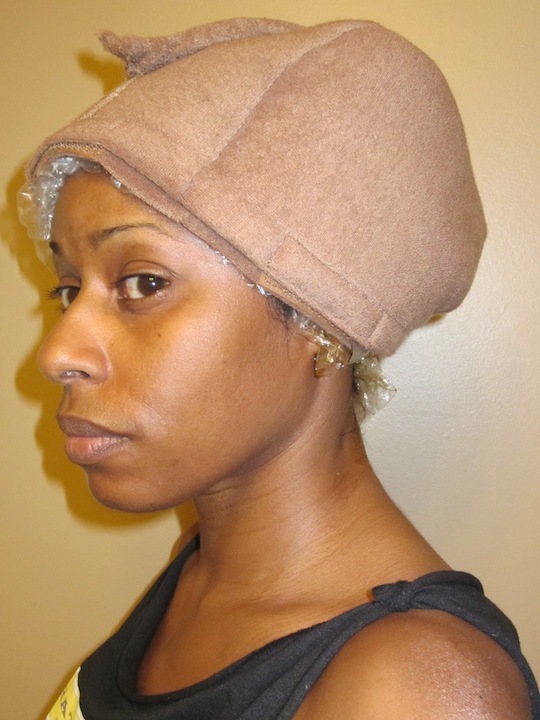 I use a plastic cap then put a wig cap over the place cap then a satin sleep cap. I never deep-conditioned over night. I only did a henna treatment and the occasional pre-poo over night. I usually only deep condition for 15-30 minutes. After reading the The Natural Haven’s deep-conditioning article, I made sure not to over condition by following the instructions on the product. If it’s an all-natural concoction then I leave the mixture on longer, but I rarely mix products. Sometimes I want to be in and out with the whole wash, condition, style process. I have to deep condition with heat to see a benefit. I could leave conditioner on for 2 days and it will just sit on top of my hair. I always DC with heat Tiffanita. I feel the same. I don’t feel like it does anything without heat, though it probably does something. I also cool and seal in my DC with a regular DC before rinsing and that makes a big difference for me too. I deep condition for an hour. Pre poo also for an hour. Never overnight because I’m afraid I’ll mess up my pillows. Hi! I used to deep condition overnight a few years ago (messed up my pillows terribly), and I guess my hair was mushy, but I didn’t know any better and preferred it to my normally dry hair. However, this winter, I’ve started baggying my ends. Do you think over conditioning is still possible if I’m only using the water that should be in my hair shaft? A simple Thing, so, when you baggy, you’re not applying any additional product? Or, are you spritzing lightly with water and wearing a baggy? Either or, if your hair isn’t saturated with water and conditioner and has been dry, then that is probably fine. But, just keep an eye on how your hair feels. If it starts feeling mushy or the curls start getting limp, your hair may be over-conditioned. I deep condition once a week, but always with my steamer so it’s about 20-30 minutes. I usually use cholesterol conditioner mixed with various oils. As a treat, I’ll use a hair mask. I am a low porosity girl, and I have been trying something different with my deep conditioner. After pre-pooing with oil only on dry hair the night before, I shampoo with a sulfate free shampoo, and apply my deep conditioner (heated suave naturals mixed with olive oil and glycerin), put on my heating cap for 30 minutes. And that’s it, I leave it in. Of course, when I applied the DC, I twist my hair in 8 sections.. I get the best results! And no need to moisturize my hair until the next wash day. Shamarah, when your hair is over-moisturized it actually isn’t too hard to correct. I wish I had heard from you before you cut your hair! You probably would have still needed a trim because you want to clean up broken off ends so that they don’t split. But, maybe you wouldn’t have needed to cut so much. Anyway, when your hair is over-moisturized, doing a protein treatment (like ApHogee) or using a good protein conditioner (like Aubrey GPB) can give the hair the strength it needs. Over-moisturization can be corrected with 1 or 2 protein treatments. The harder thing to correct is protein overload. So, it’s important to use protein properly (followed with moisture) and to not overdo it. I pre poo with either my Aubrey products or coconut oil for 30 min. or longer. I deep condition only 30-60 minutes. “Nobody got time for all that!” Lol. LOL! Erica, seriously, I hate doing the dry detangling to apply pre-poo (1-2 hours), 30-60 min. pre-poo, 1 hour washing/detangling, 30-60 min DCing, 1 hour styling. To me, sleeping in the DC overnight is less work!! LOL!! I did the above routine yesterday and it was all afternoon!! If I had just applied the pre-poo without worrying about detangling, it might not have taken as long though. And, I actually think I lose less hair when I just deal with it in the shower. But, it makes the shower routine rough :(. So, I’m torn!! Thanks so much for this article. I am beyond the point of guilty….and lazy. LOL. And now I also know why my hair came out the way it did this last DC session. I DC’d for everrrr, overnight and some (I gotta stop being so lazy). But now I am going to rethink my whole Sunday evening routine. I’m glad I was to lazy to do my routine tonight and instead decided to respond to emails and do some overdo blog reading. LOL! I’m still going to work on the lazy part though. 🙂 Thanks so much for sharing. You’re very welcome Kisha_Michelle! And, as you see, you are not alone!!! Some DC overnight intentionally, but I think many of us have done it just because we don’t feel like finishing our hair routine in the evening. But now, we’re on the path to recovery ;)! LOL!! So informative! Thank you for this!! This was supremely enlightening! Thank you. I usually do 30 to 40 minutes with a heat cap, but I’ve never conditioned overnight, except the occasional use of olive oil or jojoba. I get really bad headaches when I leave my deep conditioning overnight? I’ve heard that from others! I would definitely say to NOT wear them overnight if you are getting headaches! hello hairscapades. i searched ‘can i leave conditioner in my 4c hair overnight’ and was brought here. i want my hair so that is why I leave it overnight. But from reading this article that is wrong. I didn’t know that I have been messing with my hait keratin. It is just that my 4c 4d 4f 4z hair is so tough. I have to plat it while wet or I cant comb it. So I thought leaving conditioner on would soften it bc no matter how gentle I am, no matter how wide toothed and seamless the comb, my hair snaps. Please if you could , your reccomendations. Up above in feb you replied to shamarah to use apogee and aubrey GPB. What I use now is generic store dandruff shampoo and suave naturals ocean breeze2x more moisturizing conditioner. Hi Lilkunta, this is the thing, you have to do what works best for you!! If you find that your hair thrives and is not breaking or overly soft when you leave DCs in overnight, then do you!! I am all about doing what is best for YOU!! I just try to share things that I’ve learned and that I’ve found helpful in case they might help someone else diagnose their hair. What is a protein wash thingy? I do it cuz I’m lazy and also right before I put braids in and right after I take them out. Do you leave it in your hair WET for a full week? If your hair isn’t wet, but you allow the DC to dry in your hair, that’s different from leaving the hair soaking wet with conditioner. It’s the wetness that weakens the hair. And, I’m all about doing what works for you! If it works, got for it!! I use conditioner as a setting lotion, have been for years. It works wonders for my hair, but thanks for the info. I now know I don’t need a weekly deep condition at the salon. Using conditioner as a setting lotion is different from leaving a DC in for hours. Since your hair is drying with the conditioner, the issue with hair being wet for hours and weakened doesn’t occur. Some people have issues with using daily conditioners as leave-ins because they can build up on the scalp, but for some, they work great. I used a regular conditioner as a leave-in for years too and my hair did fine with that, though I think it got better when I started using conditioner formulated as a leave-in instead. As to not needing the weekly DC at the salon, a DC works differently from a daily conditioner. A DC has a smaller molecular structure to penetrate beneath the cuticle layer into the cortex to strengthen/moisturize the hair from within the strand. A daily conditioner has a larger molecular structure and is formulated to sit on the surface of the hair to improve appearance and “close” the cuticle layer to improve manageability. So, I wouldn’t entirely eliminate DC’s because you use a daily conditioner as a setting lotion. What about just plain oil, does the same rule apply (no longer than 30 minutes)? Sorry for the delayed response. Do you mean oil on wet hair or oil on dry. See my above replies about the issue is related to hair being kept in a wet state for a long time vs. allowing conditioner to dry in hair. I suspect the same would hold true for oil. If the hair is constantly left in a damp state with oil (or overnight wet, coated with oil, and covered with a plastic cap), some of the same problems may be caused. However, if it’s working for you, I say stick with what works. I’m always just trying to shed light on things I’ve discovered in case others are having problems and trying to figure out what is wrong. You may want to reach out to Natural Haven for the science on whether the above snippets I shared hold true for oil on wet hair overnight. HTH! Hi, when using oil for a pre poo, it doesn’t make sense to put oil on wet hair because water and oil doesn’t mix. The oil will just sit on top of the water and not penetrate into the hair’s cuticle. In other words, you’re just wasting product . Therefore, you should put oil on dry hair. Thanks for that. I always use this oil my mum has, but I’m not even sure what it is. My hair is very soft now, but weak as you say. I will not do a hair mask and leave it for 39 mins and wash it. Thanks for having an interest in this and sharing useful hair health tips. Hi Starr, see the linked articles on protein in the first paragraph. I saw immediate improvements after one treatment with the Aphogee 2 Minute Keratin Reconstructor (think that’s the name; it’s in one of the linked articles). Over-moisturized hair can be fixed pretty rapidly with one or two protein treatments. Okay, thanks. The articles were really helpful. I’m going to try it. My hair was really knotty so I detangled by initially spritzing my hair and then applying a conditioner. I wasn’t feeling too well so I fell asleep that afternoon and only woke up just this morning with the cap still on and my damp conditioned hair. I don’t have any protein stuff to counteract over moisturisation. What should I do?! Hi Soleil, your hair is not likely to have an issue after one overnight session. It is repeatedly doing this that can cause the issue. However, if you do notice that your hair is feeling mushy and/or breaking/shedding excessively, you can do a quick at home protein treatment with yogurt or eggs. Just don’t use heat if you use eggs or you’ll have scrambled eggs stuck in your hair. I know this is an old post, but I’ve just happened upon it (you were mentioned in Saving Our Strands post today) and I’m realizing this could be why I’m seeing so much shedding. I’ve been so confused as to why so much of my hair is coming out during my wash day…. although, it doesn’t appear I’m getting the super soft results afterward. Thank you! I just started searching for this topic. Today has been a doozy and I have had this DC on my hair for over 12 hours due to some unpredictable events. I’m fearful as to what my hair may be going through right now. I’ve been experiencing some shedding but my hair is strong. I hope this one day doesn’t ruin my hair. I’ll definitely keep the page updated on the status of my mane. I overnight pre poo but only because I hate washing my hair late and it seems every wash day I get so busy doing something around the house that I lose track of time. See I always thought even though the deep conditioner has been on a while that it was still being absorbed because as a blonde my hair is just so in need of moisturization. I always leave it on overnight AND when I get out of the shower after its dried maybe 10 minutes I’ll add more conditioner mid ends and down because it smells so good and just is super soft to the touch. I have a cocount oil mask I only leave on all night once a week that’s the only one with protien. I hope I didn’t get off subject, the conditioner I leave in every night and day is regular or just deep conditioner without protien.